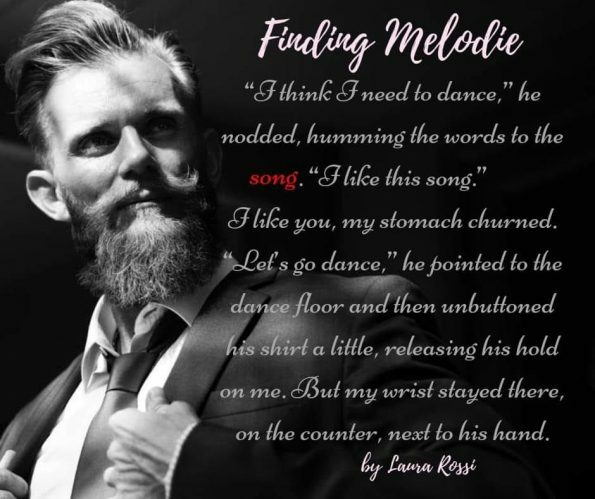 Review – Finding Melodie by Laura Rossi – 5 Musically Heart-Warming Stars!!! Melodie has an obsession, for Office Guy. This obsession has the power to break her. However, Melodie cannot let go of her Office Guy, no matter how hard she tries. Determined to help, will Melodie in turn break her heart? Laura Rossi has delivered a beautifully written novella, one that held me captive from start to finish. This story, their story, Melodie and Office Guy’s, is the perfect length. It isn’t too short; it has all the details, cleverly, and clearly delivered, it has everything you need for a short, enjoyable read. This romance is a perfect pick me up, or short read, when you need to escape but haven’t the time for a lot of reading. It’s also the kind of story that will stay with you, having you relive it in your mind, time, and time, again. It’s also a book I could happily read again, and again, too. I got all the feels with Finding Melodie, I was captivated by Melodie and the story she was telling. I too, at one point felt obsessed with Office Guy, I wanted to hug him, and I wanted to throttle him for not seeing the many things that were staring him in the face. This story truly was the perfect length, and it purely the greedy side of me that would have loved to have carried on reading, purely because I had fallen in love with Melodie and her Office Guy so much. Looking for a pick me up or looking for a short read that has everything you need from a romance story, then Finding Melodie is for you.